Ancient Ways Cafe (and El Morro RV & Cabins). Holiday shoppers, take note: Unique, handmade, and budget-friendly treasures abound in this route’s trading posts, galleries, and less formal locales (like the dining room of Earl’s Family Restaurant, in Gallup). Although you can take I-40, we recommend noodling along on the charmingly circuitous N.M. 53/N.M. 602 loop between the Historic Route 66 communities of Grants and Gallup. 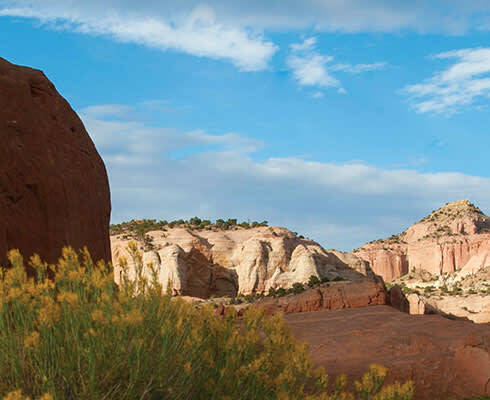 You’ll encounter ancient volcanic features, a sandstone cliff base that’s been etched with graffiti by 17th-century conquistadors and 19th-century U.S. Army troops, and one of the most artistically rich Native communities in the Southwest, Zuni Pueblo. Arrive in Grants by early afternoon to give yourself time to visit the excellent New Mexico Mining Museum. This town of about 9,000 was established as a railroad outpost in the late 19th century, but its greatest boom period commenced in 1950, when a local Navajo shepherd named Paddy Martinez discovered uranium ore just outside town at Haystack Mesa. For the next three decades, the town thrived as one of the nation’s largest uranium suppliers. In the museum, you can embark on a self-guided tour through a re-created underground mine filled with equipment and tools of the trade, and detailed interpretive displays that tell the tale of the local uranium fortunes. (By the 1990s, the demand for U.S. uranium had slowed to a trickle.) There’s also a fantastic collection of gems and minerals collected from all over the world. Fans of old-time steakhouses will find a beauty in downtown Grants. Darkly lit La Ventana turns out juicy, thick-cut rib-eye steaks and tender prime rib, plus slow-cooked pork adovada, grilled salmon, and chicken fajitas. There’s a well-chosen beer and wine selection, too, as well as a full bar. Among the several reasonably priced chain options in Grants, the clean and contemporary Holiday Inn Express offers spacious rooms with microwaves and refrigerators. Additional perks include an exercise room and indoor pool and complimentary breakfast in the morning. Or spend the night just outside El Malpais National Monument at the stunningly situated, eco-conscious Cimarron Rose B&B, 30 miles southwest of Grants on N.M. 53. The inn’s three rustic-chic suites intersperse knotty pine and earth-tone walls, fireplaces, fully equipped kitchens, and private patios that make for awesome stargazing on clear winter nights. Hearty full breakfasts are delivered to your door each morning, and the on-site Tierra Madre Arts Gallery stocks an impressive selection of fair-trade Zuni and Navajo pottery, carvings, textiles, and paintings. If you spent the night in Grants, fuel up with breakfast in nearby Milan at Wow Diner, a shimmering stainless-steel restaurant with a ’50s-inspired interior. Morning favorites include decadent cinnamon roll pancakes, spicy huevos rancheros, and rich eggs Benedict. Don’t let the prosaic setting behind the Petro truck stop put you off—this is the best breakfast fare in the area, and the friendly servers here greet both locals and outsiders like family. As N.M. 53 suddenly curves in a westerly direction about 15 miles south of Grants, the landscape changes dramatically. Here the road skirts the northern edge of El Malpais National Monument, a sweeping 350,000-acre expanse of stark, blackened lava fields and dormant volcanoes. Visible to the north of Grants is soaring Mount Taylor, which rises to 11,305 feet. El Malpais means “the badlands” in Spanish, and this dramatic landscape does, at first glance, appear rather impenetrable. Stop by El Malpais Information Center for maps and advice, and to check out exhibits on local geology that help explain, for example, the difference between cinder cones and shield volcanoes. For an up-close look at the volcanic landscape, backtrack a couple of miles along N.M. 53 to the El Calderon section of El Malpais. From the parking lot, it’s just a few hundred feet to a hollowed lava tube called Junction Cave. You can peer deep inside, but note that entering the cave is prohibited November 1–April 1 in order to protect a thriving bat colony. The rest of the year, you can actually scamper through the tube. The longer but still easy El Calderon loop trail winds for three miles past additional intact and collapsed lava tubes, as well as a volcanic crater. Just east of El Morro National Monument, you’ll find a pair of quirky gems nearly adjacent to each other. Ancient Way Cafe occupies a cute red-roofed log-frame cabin and serves fresh and healthy sandwiches, salads, and sweets, with an emphasis on free-range meats and organic produce. Save room for a slice of sweet and spicy Granny Smith apple pie seasoned with green chiles and piñon nuts. This homey cafe is part of El Morro RV Park & Cabins, with a good selection of RV and tent sites plus four adorable, affordable cabins. In the adobe house next door, Inscription Rock Trading & Coffee Co. is a fine option for a bracing espresso drink, a green chile-cheese bagel, or a fresh-fruit smoothie—be sure to browse in the on-site gallery, which represents several talented Native American artists from the area. On April 16, 1605, Spanish conquistador Don Juan de Oñate etched his signature into the base of a towering sandstone wall that Zuni Indians had been marking with petroglyphs for centuries prior. The top attraction at El Morro National Monument, Inscription Rock contains dozens of neatly etched autographs and carvings from early Spanish colonists, frontiersmen, and Civil War–era U.S. military troops. When you arrive at the park, stop inside the visitor center to view a 15-minute movie that sheds light on El Morro’s 700-year human history. You may also borrow a free guidebook that provides the backstories to the most prominent inscriptions. Then set out on the short, paved half-mile trail that passes beside the wall. If you have time, it’s well worth continuing along the two-mile Headland Trail loop, which you can access from Inscription Trail. This somewhat rocky trek climbs 250 feet in elevation, rewarding hikers with dazzling views of the surrounding Zuni Mountains. Upon reaching Zuni Pueblo, a bustling community of about 10,000, you’ll notice that the main commercial drag (N.M. 53) is lined with several trading posts. One of the most respected of these shops, All Tribes Trading Post, carries an immense selection of textiles, artwork, fetishes, kachinas, paintings, and jewelry by Zuni, Navajo, and Hopi artists. Zuni has one of western New Mexico’s most memorable lodging options, the inviting Inn at Halona, which is right in the center of the village and contains eight artfully decorated guest rooms furnished with Pendleton blankets, colorful Mexican folk furniture, and original paintings by noted Zuni artists. The blue-corn pancakes are among the favorite dishes served at breakfast each morning. The largest town in the region and New Mexico’s gateway to the Navajo Nation, Gallup (pop. 21,700) provides visitors with plenty of incentive to linger for an extra day. Start out with breakfast at venerable Earl’s Family Restaurant, which has been serving straightfor- ward American, Mexican, and Navajo fare since 1947. Licensed local Native artists move about the dining room while you eat, proffering their crafts and wares. Gallup is home to one of the state’s best-preserved and most populous stretches of Route 66. Stroll along downtown’s main drag to encounter numerous examples of handsomely preserved Victorian and Pueblo Revival buildings, some of them decorated with colorful murals. Visit the imposing El Rancho Hotel, which opened in 1937 and hosted dozens of Hollywood luminaries—Spencer Tracy, Mae West, Ronald Reagan, Lucille Ball—during its first couple of decades in business, when directors started filming westerns in this part of the state. The two-level atrium lobby is festooned with vintage black-and-white celebrity photos, Navajo rugs, mounted wildlife, and Old West oil paintings. The restaurant serves steaks, green chile cheeseburgers, and chicken enchilada platters, but many prefer the dimly lit 49er Lounge, a convivial locals’ joint with a great beer and tequila selection. Stop by the Gallup Cultural Center, which occupies the city’s grandly restored 1918 railway station and contains exhibits on the town’s rich Navajo, railroad, and Route 66 history. For more than four decades, Bill Malone operated other important trading posts—including the one at Arizona’s Hubbell Trading Post National Historic Site—before opening his own impressive space in Gallup, Bill Malone Trading Company. His close relationships with numerous Navajo artists ensures a steady supply of fine pottery, rugs, jewelry, and art. Prices are exceedingly fair. Head a few blocks away to a slightly out-of-the-way residential section of town for a delicious, filling lunch of authentic Mexican food at El Metate Tamale Factory, a no-frills local favorite for chile-smothered enchiladas, lengua tacos, and, of course, handmade pork and chicken tamales. Wrap up your adventure a few miles east of town with a visit to glorious Red Rock Park. Its popular hiking trails, each between three and four miles, reward trekkers with panoramic vistas of the looming, rusty rose sandstone formations. The first weekend in December, some 200 hot air balloons take to the skies above the park for the 34th Annual Red Rock Balloon Rally.